Oh dear. People are embracing the bubble and, as it happens in every bubble, fantastical narratives are emerging to justify the valuations and the price momentum as folks cannot square reality with non stop levitation in equity prices. Never mind that the final price spurt in any bubble is the most dangerous and most deceiving. If debt doesn’t matter, inflation doesn’t exist, and yield curve inversions can be prevented by an all powerful Fed we must truly live in a world of milk and honey. After all Q1 GDP is flying higher to unforeseen levels. Looks like Alan Greenspan is right. Get a big rally in $SPX and suddenly your GDP looks much better. 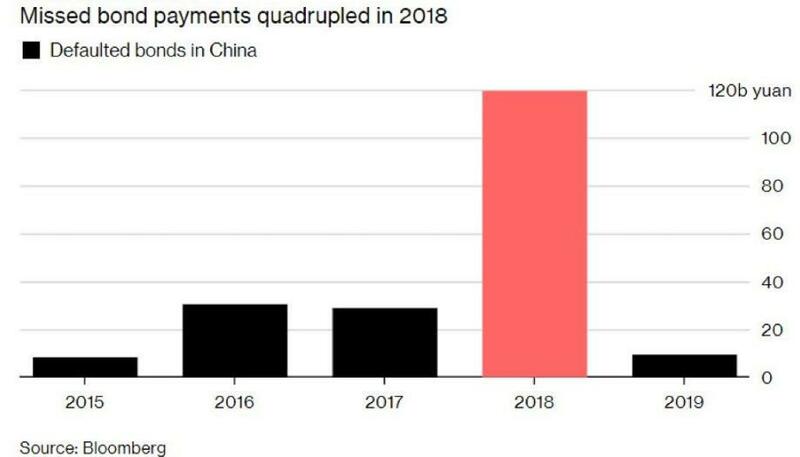 Ever since Beijing allowed private Chinese companies (even certain state-owned enterprises) to officially fail for the first time in 2016, and file for bankruptcy to restructure their unsustainable debt loads, it’s been a one-way street of corporate bankruptcies, one which we profiled last June in “Is It Time To Start Worrying About China’s Debt Default Avalanche“, and which culminated with a record number of Chinese onshore bond defaults in 2018, as a liquidity crunch sparked a record 119.6 billion yuan in defaults on local Chinese debt in 2018. I would like to comment on Dr. King’s recent discussion on academic freedom (Courier, May 24). It appears that King’s notion of academic freedom are closely linked to specific beliefs about the scientific method and how research proceeds in the scientific community. Implicit in King’s entire argument is the idea that scientific research is an ‘objective’ enterprise. It would appear that this objectivity can only be maintained by ensuring that external pressures do not interfere with research. These beliefs are displayed in the passage by Gilmour which King uses to argue that, because academics are disinterested and display integrity, they should be granted time, money, and a freedom which allows them to perform research unfettered by social and political pressures. This whole notion of integrity and disinterest within the scientific community, however, needs to be critically examined. An ‘objectivist’ belief, such as that presented by King, holds that scientific knowledge is improving and growing constantly through a type of piecemeal process which builds upon previous research. Ultimately, the ‘truth’ is approached by an accumulation of data and ignorance is left behind, a remnant of insufficient data. This view of science supports an empirical theory of knowledge which presumes a complete detachment between the scientist and object of research. Researchers are subsequently thought to observe ‘facts’ quite independently of their consciousness. This, in turn, implies that some type of an objective reality exists and that humans can accurately determine what it is through rigorous, non-subjective procedures of science. More recently, however, some researchers are beginning to realize that science is a socially-embedded activity in which research is pervasively influenced by the sociocultural milieu within which it operates. Various psychological and sociocultural factors serve to guide scientific research in predetermined directions. This belief debases the stereotypical view of science as a purely objective enterprise. In fact, some researchers have taken a more radical stand and argued that truth itself is just what a particular scientific community passes at a particular time; that facts are created and we make them fit into our predetermined categories; and that truth is merely the truth of those in power. Alternatively, it can be argued that the facts are real enough but in the interpretation that necessarily follows empirical observations, hard ‘facts’ are tainted by external pressures. These pressures are believed to influence research and its conclusions, even to the point of ‘cheating’. Because of such pervasive pressures within the scientific community, self-policing by academics is not an adequate solution. The ideas that ‘hard’ facts exist and that science progresses by a patient collection and sifting of these objective facts are perpetual myths propagated by scientists. Researchers must keep in mind that their ideas and fundamental assumptions have been directed by external forces, both in and out of the scientific community. Pure objectivity, as supported by logical empiricists, does not exist. Humans live in a complex world of intersubjectivity. Since research is a subjective and interpretive enterprise, interpretations will inevitably be pluralistic in nature and there is no monopoly on truth. A diversity of interpretations is, therefore, both inevitable and necessary. However, this should not be construed as academic anarchy. Scholars should attempt to understand their own subjective biases and how their sociocultural milieu influences their work. It is only by doing this that they may become more sensitive to the restrictions that are imposed upon their interpretations. Perhaps this endeavour would result in a useful balance between the outdated view of science as objective and the radical notion of a total lack of truth. This alternative view of the scientific enterprise has profound implications for academic freedom. King’s argument would appear to be based upon the idea that science is totally objective. But if this is not a valid assumption, as I have tried to argue, then notions of academic freedom must be reassessed. Outdated arguments which insist that science will lose its objectivity and usefulness if external pressures are introduced are no longer compelling. Scientific research has always contained such pressures. It is now time for researchers to confront such influences head on. Hiding behind the concept of academic freedom is not going to aid scientific research or make it any less subjective. The notion that we must ‘support our troops’, that we must be ‘patriotic’ towards our nation state and its military because they are fighting for our freedoms and democracy is at a minimum misguided and more egregiously a manipulated conditioning by the state. The idea that military ‘interventions’ are necessary to maintain our freedom or expand democracy ignores the evidence that the invasion and occupation of foreign sovereign states is motivated by imperial expansion to control fundamental resources (e.g. fossil fuels) and sustain or improve financial/economic hegemony (i.e. maintain the US petrodollar as the world’s premier reserve currency). War is racket as US Marine Corps Major General Smedley Butler argued. It serves the financial interests of the State oligarchs. The State, however, must persuade the masses that this is not the case. It must have the support of the people for the political class to remain in their privileged positions and avoid blowback from the citizens over which they rule. The State uses this patriotic ‘feeling’ to convince its citizens that any ‘attack’ is upon them and not upon the ruling caste. Any war between rulers thus becomes a war between people, with the masses defending the rulers in the misguided belief that they are defending themselves and certain ideologies. In Hegemony or Survival, Noam Chomsky argues that Empire (the American one in particular) attempts to maintain its hegemony through military, political and economic means, demonstrating a total disregard for democracy and human rights in the process. He goes on to provide evidence that ‘preventative’ wars by the current global superpower are often used to keep potential/imagined threats from ever reaching a stage where they become real threats to its hegemony. There is also increasing evidence that, in fact, the State’s citizens have far more to fear from its own government with regard to a loss of freedoms and erosion of democracy than some concocted threat from outside its own borders. The mass surveillance programmes revealed by NSA insiders, undermining of elections, and constant devaluation of currency/purchasing power comes to mind. The State, therefore, relies upon and manipulates its citizens’ very emotional notion of ‘patriotism.’ It uses it to maintain and expand its control of resources (both physical and financial) both domestically and abroad. And those who question or challenge it are branded treasonous and attacked/ostracised in any number of ways. Questioning is not allowed. War is Racket. 1935. Smedley D. Butler. Anatomy of the State. 1965. Murray N. Rothbard. Hegemony or Survival: America’s Quest for Global Dominance. 2003. Noam Chomsky. Avoiding loss of one’s ‘wealth’ from whatever crises may befall you and/or your family seems paramount to helping avoid or at least mitigate the negative consequences that accompany emergencies and disasters, or even the general decline of civilisation. With currency devaluation, government overreach, civil unrest, bank bail-in legislation, labour strife, market corrections, negative interest rates, geopolitical uncertainty, economic decline (perhaps even collapse), it seems almost impossible to protect one’s wealth completely without even worrying about everyday calamities that can place financial stress upon an individual and/or family. The following suggestions seem the most likely way to prepare for an uncertain world, and avoid some of the more dire consequences of increasing volatility and possible confiscation by the-powers-that-be (a concern that must be considered as governments become increasingly insolvent). A common question that arises when contemplating emergency/disaster planning is where to start? First, focus on yourself and basic survival gear. Skills and knowledge you acquire are the most difficult to be taken from you. First Aid courses. Fitness/healthcare-oriented activities. Hunting courses. Archery/gun use. Gardening/food production knowledge. Survival training. ‘Handyman’ skills. Building a ‘survival’ library. Activities, training, and literature that can help you and your family cope with unexpected crises are perhaps the wisest ‘investment’ and can’t be confiscated by the-powers-that-be. These should likely be a priority. When an avalanche is about to descend upon you, does it really matter which snowflake was the penultimate cause? While it’s interesting (in a mental masturbation kind of way) to debate the genesis of a pending market collapse, environmental chaos, or energy cliff, in the end, it really doesn’t matter–unless, of course, we are able to curtail the impending crises by correctly identifying the variable(s) involved and mitigating the consequences, but the likelihood of that outcome is looking increasingly unlikely as systems are prone to overshoot and collapse. One of the ‘insights’ I’ve had over the past several months as I read the competing narratives that are floating about the globe and attempting to ‘explain’ why the dilemmas we are facing are happening is that we really don’t understand complex systems and the way they behave, so we are bound to cling to simple explanations that support our personal biases and reduce the cognitive dissonance that results when our belief system is challenged. A large part of the problem, I believe, in discerning which variable(s) play(s) the most impactful role in creating a crisis is the tendency for various interest groups to spin the ‘facts’ to support their particular narrative. For example, whether the cause of the oil/commodity price collapse is the role of central banks in manipulating the economic system, the limits to growth, overproduction (by Saudi Arabia? US shale? Canadian oil sands? ), and/or economic contraction (global? Europe? China? emerging markets? ), the result is a loss of thousands of jobs, domestic unrest, and increasing geopolitical tension as nations try to counter the deflationary collapse that appears to be resulting. Many Western politicians and journalists are pointing the finger at the production levels of the Middle East, particularly Saudi Arabia, and their ‘refusal’ to cut production, but data from the past decade shows that supply has increased significantly because of US shale and Canadian oil sands extraction rather than that of Saudi/ME. It strikes me that this ‘spin’ is simply a means of avoiding looking in the mirror and deflecting attention–blaming ‘others’ for our woes is a common means of reducing cognitive dissonance, focusing citizen outrage away from their ‘leaders’, and justifying particular actions/decisions. In the end, however, the ’cause’ is not that important to the families crushed by a sudden loss of income. And that brings me to the conclusion of this little diatribe: being prepared for whatever comes our way is the only thing that might really matter. Whether at an individual, family, or local community level–I don’t believe it’s possible or prudent to worry much beyond these–being resilient and resourceful in the coming months/years is what is going to make a difference as to how ‘successful’ one can deal with the coming dilemmas. Best of luck to everyone. I think we’re going to need it. In the 1979 comedy, Meatballs, actor Bill Murray provides a ‘motivational’ speech to his fellow summer camp counsellors and campers who are getting soundly beaten in a ‘friendly’ competition by a neighbouring camp: https://www.youtube.com/watch?v=6UZvIZAHjlY. In the end, the speech is seen not as motivational but as a message that, in the bigger picture, the competition really doesn’t matter–(SPOILER ALERT) all the good-looking girls are going to go out with the other camp’s counsellors anyways because they have all the money! During the CBC’s Ontario Today show (July 10) the theme was one of cheerleading the Pan-Am games taking place in the Greater Toronto Area and sharing plans for those games. I called to share a contrarian perspective, basically that it was another example of a massive misallocation of diminishing resources and energy (not meant as a slight to anyone involved who are caught up in trends and behaviours long regarded as positive). Getting through on my first attempt surprised me, perhaps as much as the person on the other end when I shared my thoughts. She assured me that I would be on shortly and to wait patiently. After fifteen minutes she returned to the line to inform me that I was the next caller. I was not. After another fifteen minutes, and listening to continual gushing about the event, I was informed that there was a ‘timing mishap’ and that there would likely not be the time for me to share but they would take my phone number ‘just in case’ (I was not surprised as this has happened to me before when I called with a non-supportive viewpoint). I view this as yet another example of media manipulation of perspectives, of controlling the narrative. Being one of the ‘official’ media outlets of the games, the CBC has a vested interest in portraying primarily positive support for this event. Yes, there has been some coverage of the ‘inconvenience’ to drivers but little else in terms of ‘negative’ publicity. I am not surprised, just disappointed (again) with our national broadcaster at not offering a wider perspective and/or challenging the mainstream narrative. My view, if anyone cares, is that the event is a great distraction from the various crises exploding on the globe. Most ‘humourously’, Ontario has just completed a conference on climate change (with the leaders from the Pan-Am countries…what a coincidence) with a major ‘insight’ that it is transportation that is contributing significantly to anthropogenic climate change and changes must be made to alter this. Consider, then, the amount of transportation fuels burnt just for this one event; from the travel to/from for all the participants and spectators, to the movement to/from the widely-spaced venues during the games. We can’t speak about caring for the environment and reducing our role in climate change and continue to pursue policies and actions that are the anti-thesis. Well, I suppose we can, but that just makes us hypocrites. A new section of my site, Stouffville Corner, aims to provide a variety of write-ups on topics I consider to be of primary importance/ interest. The aim was to have my local paper, Stouffville Tribune, publish them on a weekly/bi-weekly basis to bring the issues to the consciousness of my local community (thus the name). While the paper no longer accepts op-ed pieces due to its limited publication schedule (use to be published twice a week but now only once), I will still be offering the articles on a weekly/bi-weekly basis on my site beginning today with the introductory piece that has been accepted as a letter-to-the-editor. Once again my site is under reconstruction due to technical glitches that continue to plague it….if you are interested in my novel, please check out FriesenPress, Amazon.ca, or Amazon.com.